Europe gets nuked in China moon rover promo?! A simple background image has retrospectively stolen the limelight at China’s exhibit for its recently deployed Yutu moon rover: It appeared to show an enormous mushroom cloud hovering over Eastern Europe, indicating a continent under nuclear attack. The picture is described as having “a bit of paint here, a bit of stock there, a bit of manipulation here,” by its maker, James Oliver, aka 'n4u2k'. 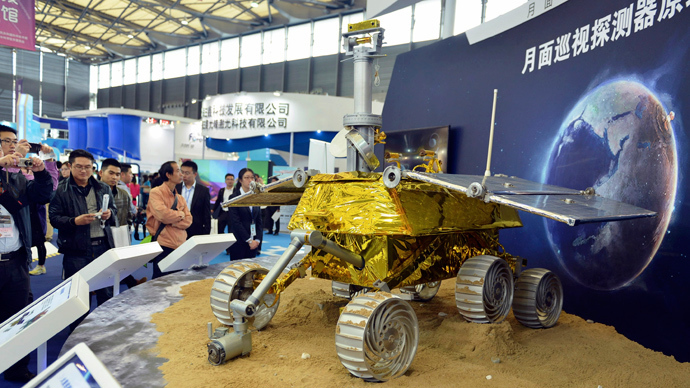 China appears to have utilized the image of the earth seen from space as a backdrop at an industry fair in Shanghai earlier this month which promoted the rover’s expedition. 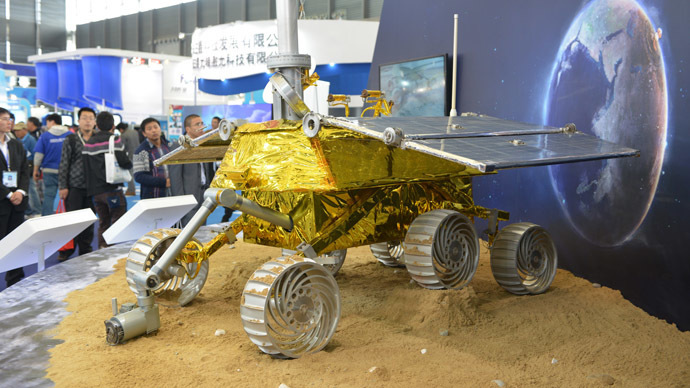 The gold-covered, moon-roving Yutu (‘Jade Rabbit’) craft was displayed at the fair by the country’s National Space Administration against the backdrop to apparently create the impression of the rover already being stationed on the earth’s satellite. However, after close inspection, it has since prompted the realization that while the rover is safely space borne, thousands of people on the ground are being blasted into oblivion. The rover, which weighs 140 kilograms, or just over 300 pounds, is to spend the next three months roaming the surface of the moon in a region known as the Bay of Rainbows. 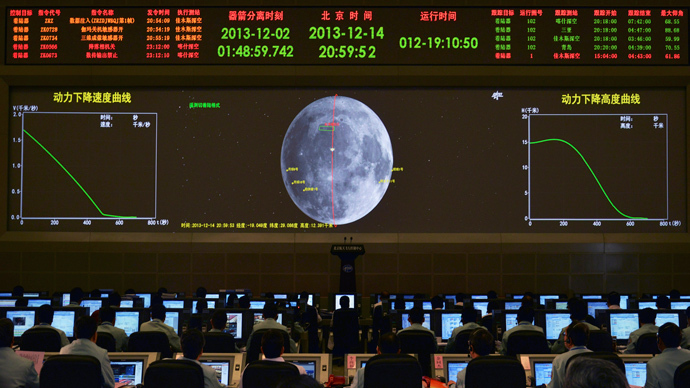 The Chang'e-3 probe, carrying Yutu, was launched on December 2, and landed on Saturday evening, local time. 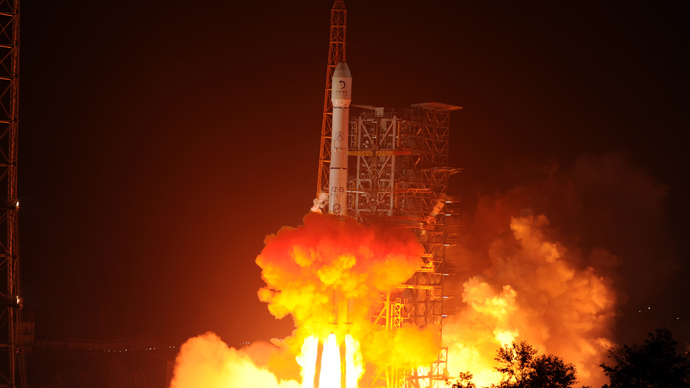 The day marked the first time a nation has successfully carried out a moon landing in over three decades and the first time that China has sent a spacecraft to the surface of an extra-terrestrial body. 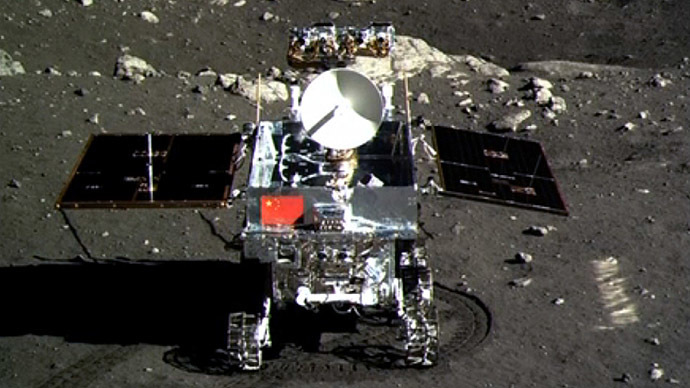 Yutu is undertaking a project in which it will dig and survey both the moon’s geological structure and surface substances, as well as look for natural resources. The spokesman said that the next missions will involve delivery of soil samples from the Moon’s surface. The Chang'e-4 mission will be an intermediate one, set to test technological ideas for at least two subsequent sample collecting missions, the first one to land on the moon around 2017.